There are some abilities that all children of folkie parents have in common. Knowing the words to most of ‘Tempted and Tried’ by Steeleye Span. Being able to hold their own at a ceilidh. Having a favourite Christmas song that dates back to the 16th century. And knowing that Fairport Convention are the folk equivalent of The Beatles. 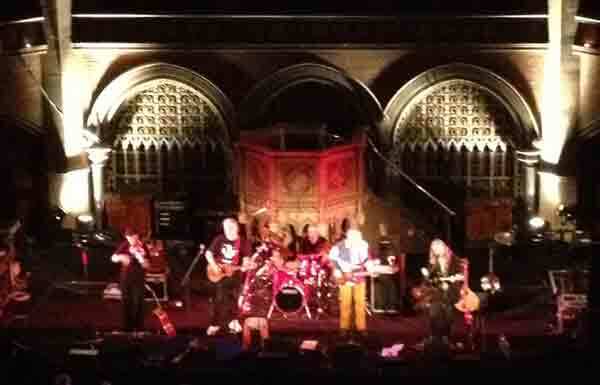 So For Folk’s Sake went to see Fairport Convention play The Union Chapel with a lifetime of Fairport intention and appreciation behind us. Of course we loved it. The band (in its various line-ups) has been playing for more than forty years, with only a few years off in the early eighties. This goes some way to explain their musical prowess and setlist brimming with classics, and we shouldn’t have been surprised by how utterly charming they were to their congregation, but their performance was even greater than the sum of its parts multiplied by its decades of experience. As ‘Fairport virgins’ (their words, not ours), we didn’t know every lyric by heart, so as the folk songs unfolded their tales of mischief and heartbreak we were spellbound. A gentle poignancy settled in the chapel as Dave Pegg dedicated the beautiful ‘Who Knows Where the Time Goes’ to Sandy Denny, who sang with Fairport in the late 60s and early 70s and passed away in 1978. But there was no melancholy, only fondness for a lost friend, and we were soon back to giggling about Simon Nicol calling himself a ‘pranny’ for not plugging in his guitar, or chuckling at anecdotes about something Dave Swarbrick did in the 70s. For all that their music is utterly classic in its genre, it’s definitely not cool; it’s a million miles from whispy girly folk ballads or rousing pop banjo. But without Fairport, the music For Folk’s Sake is filled with wouldn’t be there at all. As the set drew to a close, and Nicol bid farewell with ‘We’ve been Fairport Convention in 2013. Who knew?’, we felt a real fondness for the band that we’d grown up with, and the genre they’d helped grow. And really wanted to ask Simon Nicol why his t-shirt had a picture of a badger saying ‘BRING IT’. If you’d like a more in-depth account of Fairport Convention’s winter tour you’re sure to enjoy the blogs they wrote for us on their travels, urinals, socks and all. If you’d prefer to see them in the flesh, catch them at their very own music festival, Cropredy.